As much as we talk about major injuries on this website, mild injuries can be just as damaging to the effectiveness and efficiency of a member of your survival group. 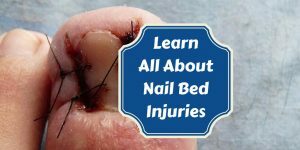 Although perhaps not as life-threatening as a gunshot wound or a fractured thighbone, nailbed injuries are common; they will be more so when we are required to perform carpentry jobs or other duties that we may not be performing on a daily basis now. Nailbed injuries are common. Prevention is best. Your fingernails and toenails are made up of protein and a tough substance called keratin, and are similar to the claws of animals. When we refer to issues involving nails, we refer to it as “ungual” (from the latin word for claw: unguis). The nail plate (body): this is the hard covering of the end of your finger or toe; what you normally consider to be the nail. 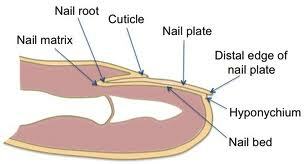 The nailbed: the skin directly under the nail plate. Made up of dermis and epidermis just like the rest of your skin, the superficial epidermis moves along with the nail plate as it grows. Vertical grooves attach the superficial epidermis to the deep dermis. In old folks like me, the nail plate thins out and you can see the grooves if you look closely. Like all skin, blood vessels and nerves run through the nailbed. 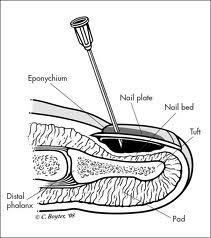 The nail matrix: the portion or root at the base of the nail under the cuticle (the cuticle is also called the eponychium) that produces new cells for the nail plate. You can see a portion of the matrix in the light half-moon (the “lunula”) visible at the base of the nail plate. This is the germinal matrix (actively makes new nail cells) and determines the shape and thickness of the nail; a curved matrix produces a curved nail, a flat one produces a flat nail. Clean the nailbed thoroughly with saline solution, if available, and irrigate out any debris. Paint with Betadine (2% Povidone-Iodine solution). Cover the exposed (and very sensitive) nailbed with a non-adherent (telfa) dressing. Some use a non-adherent dressing with Vaseline as a covering. Change frequently. Avoid ordinary gauze, as it will stick tenaciously and be painful to remove. If the nail plate is hanging on by a thread, remove it by separating it from the skin folds by using a hemostat. You can consider placing the avulsed nail plate on the nailbed as a protective covering (it is dead tissue but may be the most comfortable option). Avoid scraping off loose edges (called debridement), as it may affect the nailbed’s ability to heal. If the nailbed is lacerated, suture (if clean) with the thinnest gauge absorbable suture available (6-0 Vicryl is good). Be sure to remove any nail plate tissue over the laceration so the suture repair will be complete. Place a fingertip dressing. Some will immobilze the digit with a finger splint to protect from further damage. A contaminated wound will require antibiotics. In some crush injuries, such as striking the nail plate with a hammer, a bruise (also called an “ecchymosis”) or a collection of blood may form underneath (a “hematoma”). A bruise will be painful, but the pain should subside within an hour or two. A hematoma will continue to be painful, even several hours after the event. A bruise will likely appear brownish or blueish, but a hematoma may appear a deep blue-black. 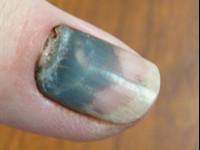 For a bruised nail, little needs to be done other than given oral pain relief, such as Ibuprofen. In a significant hematoma, however, some suggest a further procedure called “trephination”. In this instance, a very fine drill (or a hot 18 gauge needle or paper clip) is used to make a hole in the nail plate large enough to relieve pressure from the blood that has collected under the nail. It should not be too painful if you don’t go too far in. This will require Betadine, but should not be performed unless absolutely necessary; if you go too deep through the nail, you may further injure the nail bed. The finger must be kept dry, splinted and bandaged for a minimum of 48 hours afterwards. Most inexperienced medics should avoid this procedure except in the most severe cases, as the pain will usually decrease over time even if you do nothing. It’s important to know that damage to the base of the nail (the germinal matrix) may be difficult to completely repair, and that future nail growth may be deformed in some way. 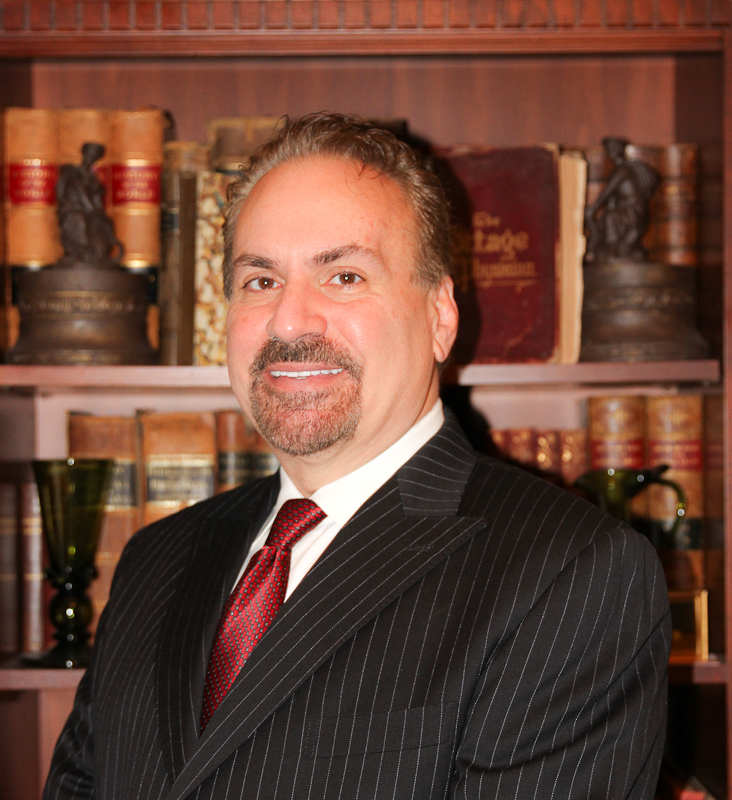 In situations where modern medical care is available, a hand surgeon is often called in to give the injury the best chance to heal appropriately. Even then, a higher incidence of issues such as “ingrown” nails may occur. 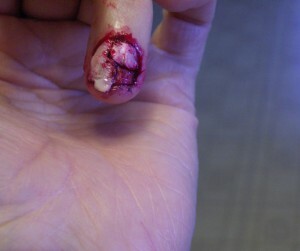 A completely torn-off nail will take 4-5 months to grow back. Remember, don’t try this at home in normal times, seek a qualified medical professional. To learn how to handle medical issues in times of trouble, check out our Amazon bestselling book “The Survival Medicine Handbook“.